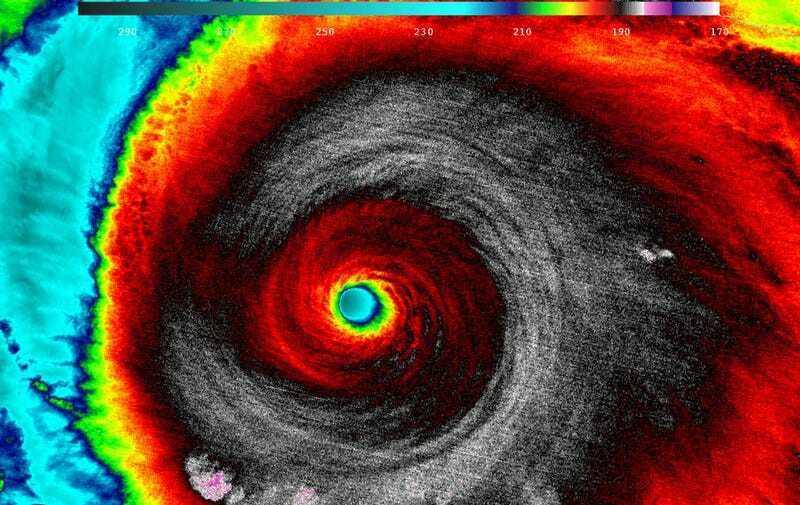 Yesterday, NASA’s Suomi NPP satellite passed over Hurricane Patricia, the most powerful tropical cyclone ever measured, and captured this stunning image in infrared. Hurricane Patricia made landfall on the Pacific coast of Mexico last night, and was downgraded to a tropical storm earlier this morning. The storm is remarkable not only in terms of how powerful it became — yesterday morning, a group of courageous men and women flew into the damn thing and measured wind speeds of 200 MPH and a minimum central pressure of 880 millibars — but how quickly it grew. On October 22, Patricia was a Category one hurricane. By 8 a.m. EDT on October 23, 2015, it had been upgraded to a Category 5 and flagged as the strongest eastern north Pacific hurricane on record. The storm is expected to dissipate over the rugged terrain of central Mexico this afternoon, but we’ll be keeping a close eye on it. Learn more about this historic weather event over at The Vane.